The big red-and-white box in the mall parking lot is empty. An electronics giant goes under. In 1949, at the beginning of the television era, a guy from the Jersey Shore started a little electronics store in downtown Richmond, Va. Sixty years later, the recession, a questionable labor decision and the flat-screen TV teamed up to kill what had become the second largest consumer electronics chain in the United States. By the time founder Sam Wurtzel died in 1986, Ward's TV had morphed into Circuit City, a big-box retailer. In 1996, the Wurtzel family gave up day-to-day control of Circuit City, which had grown to 400 stores nationally and $7 billion in sales annually, and had launched a side business in used cars called CarMax. America was soon lousy with 20,000-square-foot superstores topped by a bright red-and-white logo. The stores became famous for ugly entranceways designed to look like giant electric plugs. 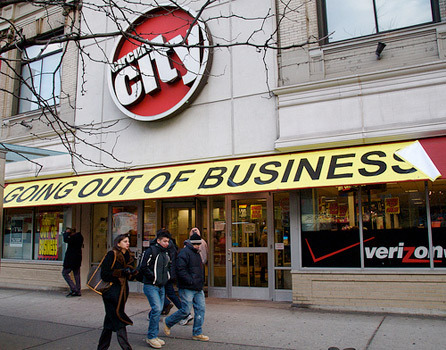 But in November of 2008, facing its third full year in the red, Circuit City filed for Chapter 11 bankruptcy. It began to close some of its 700 stores in 155 markets. On Jan. 15, unable to find a buyer or refinancing, the chain announced it was done. More than 34,000 people are already unemployed. The going-out-of-business sales will last through March. What happened? Several years ago, the company opted to end sales commissions and lay off its most experienced, knowledgeable sales personnel. As sales of expensive flat-screen televisions boomed, Circuit City found itself using clueless clerks to sell big-ticket items to people who could just as easily take their business to the next box store down the street -- Wal-Mart. Which they did. Research shows that 72 percent of Circuit City shoppers were also Wal-Mart shoppers. Analysts gave Circuit City a chance to survive 2008 if the chain had a decent Christmas -- which would depend, in part, on competitors like Wal-Mart showing mercy and not offering deep discounts on flat-screens. You know what happened instead. The chain will be missed by its newly pink-slipped employees and by strip-mall landlords, but maybe not by many others. A random survey of Salon staffers yielded no pleasant memories, only bitter tales of pushy salesmen, plug-ugly store design and dashboard-destroying car-stereo installation worthy of Civil War surgeons.